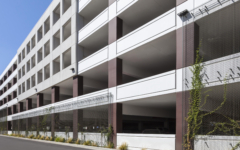 The USC San Pablo Parking Structure provides 1,200 spaces and is located in the northeast quadrant of the USC Medical Campus in Los Angeles, California. 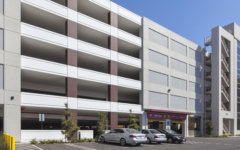 The structure’s primary focus is to provide parking for the proposed student housing project, daycare center and hotel located on the adjacent property to the south. 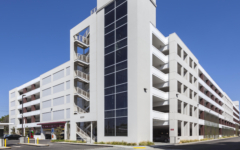 An additional entry/exit is provided on the east end of the structure and allows patrons of the daycare center to enter the structure without making a U-turn. 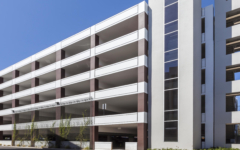 Green screen is used on all facades to assist in softening the exposed concrete and to provide a vertical relief from the horizontal expression of the exterior spandrels.